It’s reasonable to assume that a website’s loading time is important. We can confidently conclude that slow sites have usability and SEO issues because we know that users hate waiting for web pages to load and that Google uses site speed as a factor for its search rankings. 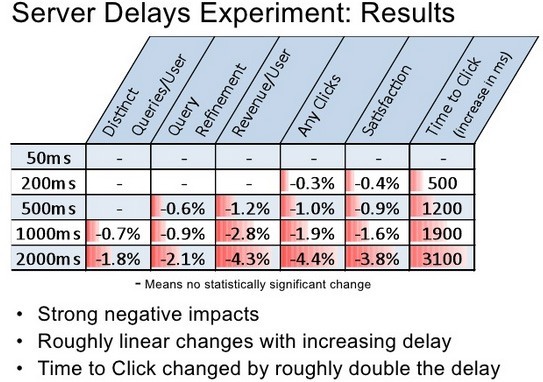 But, quantitatively, what are the other effects of having a slow website? Let us look at some cases of tech companies sharing what they have learned about web optimization. While discussing his work on Big Data in a presentation (PDF or see a report here) Greg Linden shared the significance of site speed in terms of revenue. In his work at Amazon — Linden, by the way, invented Amazon’s recommendation engine — he talked about how only a 100-millisecond delay could lead to revenues of the online company dropping by 1%. In a joint conference presentation, Eric Schurman (from Bing) and Jake Brutlag (from Google) discussed the impact of web server delays. Bing performed an experiment testing to see what would happen if their pages loaded 1.5 seconds longer than usual. Akamai is a longstanding industry leader in the content delivery space. In 2009, the company conducted a survey research study involving over 1,000 online shoppers. These stats all equate to one thing: Considerable amount of losses in revenue. In a talk, Marissa Mayer — then a VP at Google and today Yahoo’s CEO — discussed an experiment (video) she and her team ran on Google’s search results page. 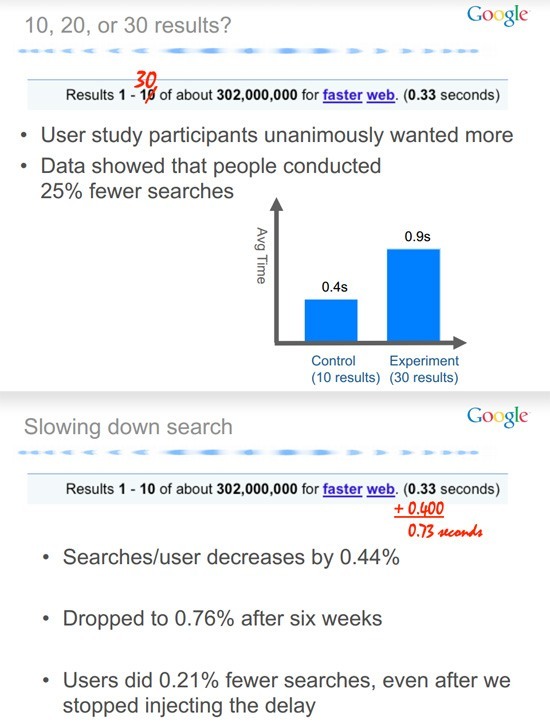 They tested the effects of displaying more results in Google searches: 10 search results vs. 30 search results. Analyzing their data, they witnessed 25% fewer searches from users that saw more search results. But was it because displaying more results meant users found what they were looking for on the first search results page, and so they felt no need to perform additional searches? After further investigation, they attributed this drop in searches (i.e. page impressions) to increased page load times. On average, the group that had more search results were subjected to longer page response times (0.9 seconds) vs. the group with fewer search results but got the page loaded quicker at only 0.4 seconds. In conclusion, Google discovered that even a few milliseconds of delay — just 500ms to be exact — could lead to a notable reduction in page impressions. A few years ago, Shopzilla embarked on a major, two-year-long redesign of their site. During this time, Shopzilla was already huge — they received between 20-29 million unique visitors a month and 8,000 searches per second. Optimizing website performance to handle this sort of traffic thus became crucial. Their web optimization efforts led to significant improvements — up to a 5-second reduction in page-loading times. 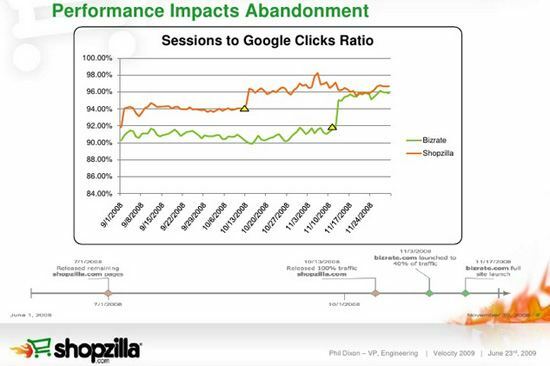 Phil Dixon, VP of Engineering at Shopzilla shared data and the lessons the company learned during their optimization efforts. 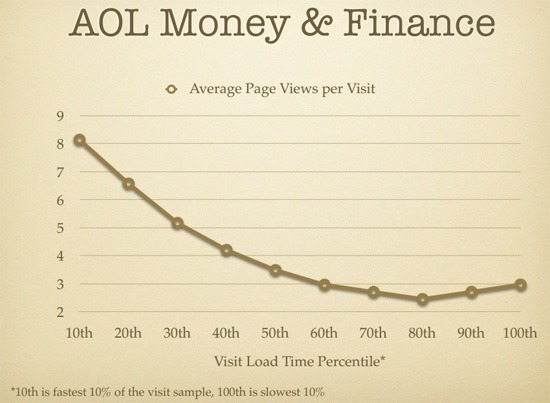 This was because in the sections of AOL.com tested, they saw up to a 160% increase in average number of page views from users in the group who were in the top 10% in terms of average load time (fastest experience), compared to those at the bottom 10% (slowest experience). These studies impart upon us one important lesson: Website speed should be a high priority if we want to build great websites. Based on these reports, we have evidence suggesting that having a slow website will have negative effects on SEO, revenue, conversion rates, usability, and UX. If you have a slow website, I’d suggest troubleshooting to figue out why it is slow. If you’re an e-commerce site selling auto parts, it may be because you have too many products on each page. If you’re an artist, you may have images of your work that are too large to load quickly. There are a number of reasons your site may be slow and identifying them and finding a solution to increase your site’s speed is vital.